In this dialog you can search for a wide range of different objects on the map. Just type in the first characters of the ident of the object you want to find and select what type of object you are searching for. After clicking on the Find button a list of found objects matching your search criteria will be displayed. When you click on one of them information about this object is displayed similar to the Map Information pop-up. Then you can click on Show on Map to center the currently selected object on the map. 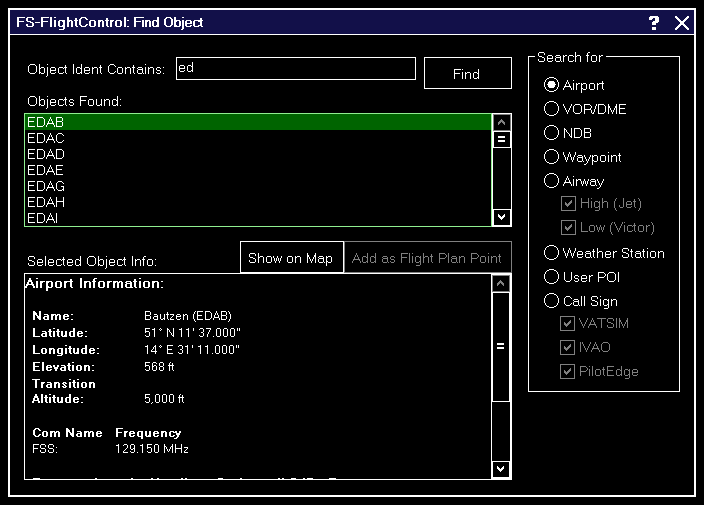 You can even use the button Add as Flight Plan Point to directly add the selected object to your flight plan if this is possible for the object type. Note: Generally all objects are found here also if the corresponding map layer is currently disabled. But this is not the case for the call sign search of the online networks: These can only be found if the corresponding layer is activated.